When traveling in large groups, there many options out there to support you from getting from point A to point B. However, some forms of transportation can be much more cost-effective than others. Follow these smart tips to discover substantial savings. When traveling in groups for either business or leisure, using a shuttle or charter bus service can be more cost-effective in many instances. Renting a car may seem like the better option at face value, but when you factor in the costs for renting each day, fuel bills, and possibly parking fees, rental cars can quickly add up in their total price. Working with a reputable, local transportation company can help you navigate unfamiliar areas and get you where you need to go much more quickly. Sometimes, prices can fluctuate due to increased demand in peak seasons. If you book a charter bus or shuttle service well ahead of time, you can avoid these price spikes in many cases. Booking something last minute can not only be extremely stressful, but it can also lead to increased costs as the company may need to hire additional personnel to meet the quick turnaround. Determine ahead of time just how much space your group will need to travel comfortably. Consider how many seats you will be filling up and how much room you will need for suitcases depending upon how many days you plan to be away from home. Once you figure this out, only reserve what you need and don’t overbook. With plenty of space underneath the vehicle, filling up the seats on a charter bus will maximize your travel costs per person. Typically, charter buses can hold 55 to 59 passengers, so plan accordingly around this and try to recruit an appropriate-sized group. Having 55 people on your motor coach is obviously much more cost-effective than 35. 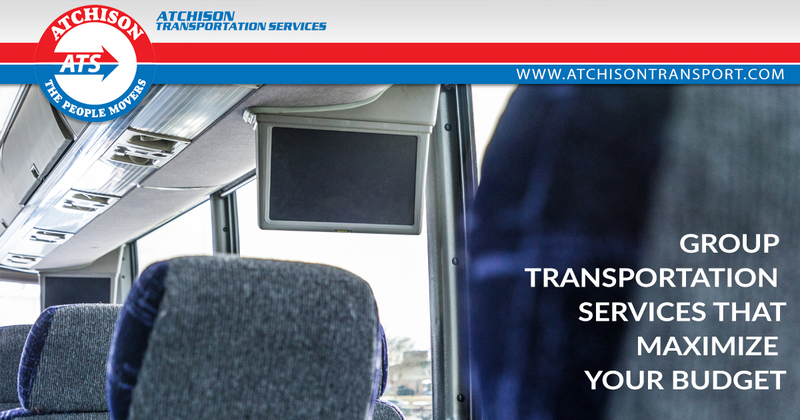 With a wide variety of affordable shuttle buses and motor coaches, Atchison Transportation Services should be well worth your consideration for your next group travel. We have over 65 years of experience servicing the Greenville/Spartanburg area and nearby cities. Contact Atchison Transportation today at 1-800-346-7129 and book your next group trip early!